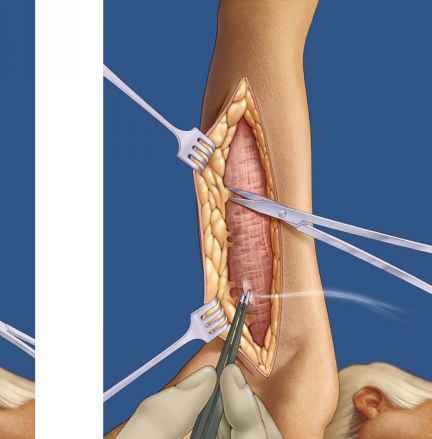 ■ Once the skin/fat flap along the fascia of the upper arm has been dissected to deep within the marked resection border, Backhaus clamps are attached to both ends and rotated gently in a cranial direction. Resection of surplus fatty tissue, in particular at the cranial and caudal incision borders, is carried out appropriately. Incision of the dermofat flap at marked sites is then done while monitoring the tension. 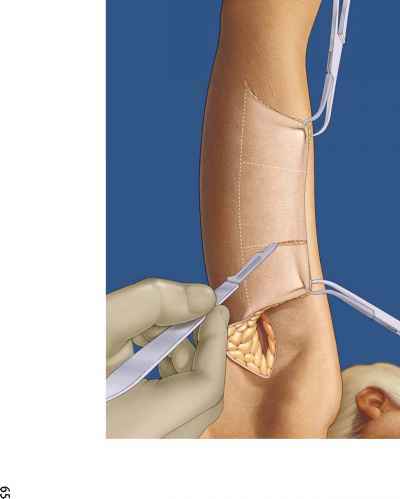 When doing this it is important that the incisions are made under slight tension stage by stage in line with the cranial incision line to prevent too little skin from being excised, resulting in an unsatisfactory result, or too much skin being excised, resulting in the scar being placed under too much tension (risk of hypotrophic scarring).